Discover delicious dairy. Made with real bananas. B12 for natural immunity support. Less than 5% added sugar. Good source of calcium. Gluten free. Milkshake with no artificial colours, flavours or preservatives. Suitable for vegetarians.49% RI* calcium per 330ml serving *Reference Intake of an average adult (8400kj/2000kcal) Is there a better fruit for mashing, thrashing and bashing? 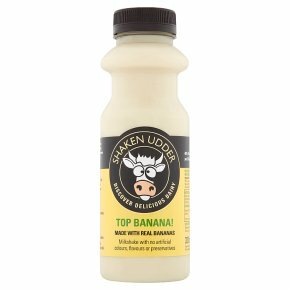 We think bananas were born to be blended, which is why we are confident this beautiful blend of fresh milk and real bananas will please the most avid banana buff.